Tuesday was a very long day. It started at 4:15 am. It didn’t end until nearly 11pm. So, she went into surgery around 8am. The first incision was at 9:15 am. We got updates from the operating room around 10, 1, and then 3pm or so. Once she was wheeled into surgery, we got some breakfast and coffee. The surgical waiting room is not the most comfortable place in the world, although they did provide lockers for our stuff. However, after breakfast, we had a wander and found the quiet room in the family life center on the 12th floor of the hospital, and we were thrilled. Quiet room, comfy chairs, and wifi. We set up camp, and did our best to pass the time. I was in the middle of A Storm of Swords (from the Song of Ice and Fire series), and it turns out that it is excellent hospital reading. It’s absorbing without requiring massive brain commitment, and, as I noted on twitter, everyone in Westeros is always having a worse day than you. Plus you’re really grateful for modern medicine. The family life center had a massage therapist in that day, and one of the workers stuck her head into the quiet room and noted that they’d had a cancellation, and would I like a chair massage? My answer was yes, please! Which helped a bit, as we were both so tired we felt jetlagged. Michael mostly internetted and read his Jack the Ripper book. We got our periodic reports, had lunch in the hospital cafeteria, and went back to the quiet room. We finally were told about 3:30pm that they were closing her up, and the surgeon came out to talk to us and tell us that he was pleased. Then it was a wait of nearly 2 hours until we could see Cait. Part of it was getting retinal photos taken (her eye doctor wants those periodically, so they were trying to take advantage of her being under anesthesia already). We came up to the ICU, and the anaesthesiologist came to talk to us. He let us know that Cait had lost a *lot* of blood. 1.5 x her own blood, and it had stopped coagulating. She nearly bled out. He looked truly rattled because they nearly couldn’t keep up. Her surgeon downplayed it a bit, but he tends to be a bit more of the “well, we sorted it, which is what counts” school. The residents were also a bit unnerved. Everyone was glad that they got the bleeding to stop, but none of them were sure why she was bleeding that much. And that scared them but good. We learned today from rounds that she had to be resuscitated at some point during the surgery. We nearly lost her. We are still sorting through the what-ifs and the emotions of that. It’s a strange place, to learn that after the fact, after she’s back here with us. She’s very swollen (she was face down for 8+ hours) and looks a bit roughed up. Just after surgery, with tube still in. 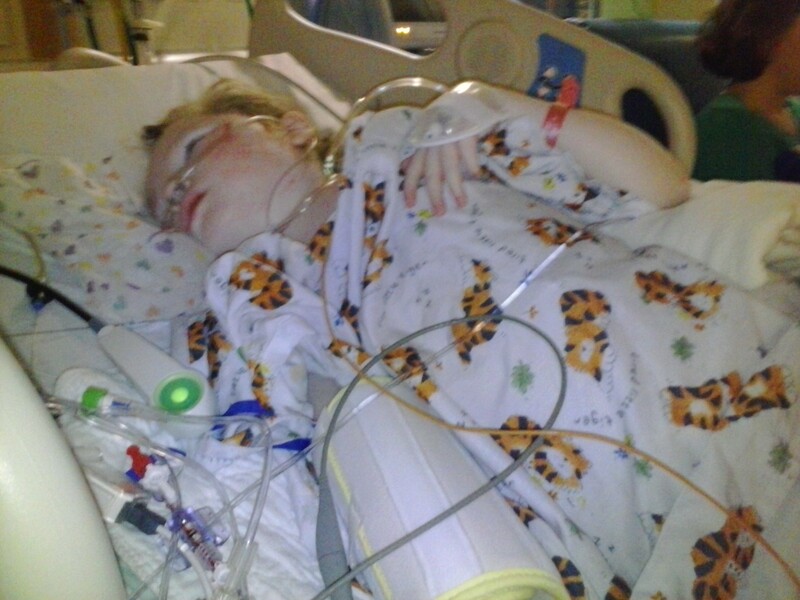 Her pain has been very well controlled through all of this, and she was heavily sedated. Getting settled in the ICU was a parade of people over several hours, so we finally got to sleep around 10:30 pm. We are sleeping on the convertible chairs in the ICU room, which is… less than ideal, but we were so tired it didn’t matter all that much. We awoke at 4 during the next round of checks, etc., and then got up around 6:30 this morning. 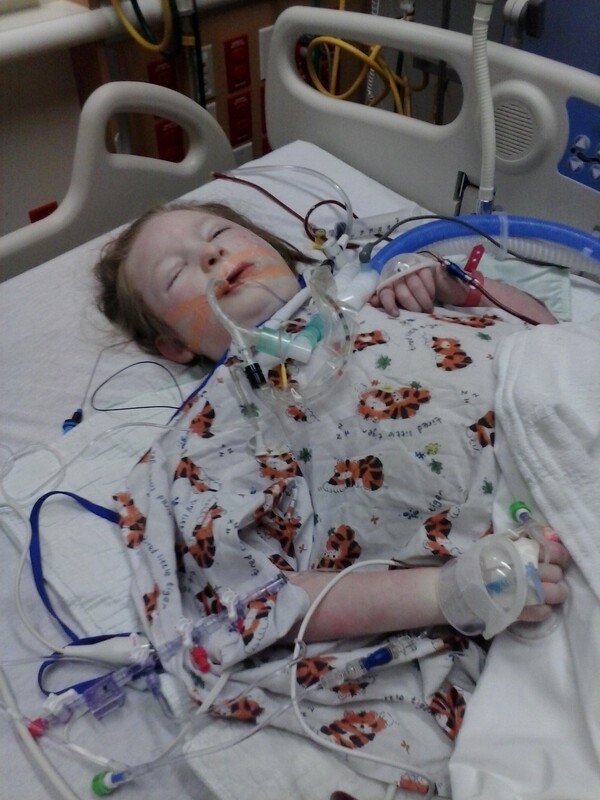 This morning, they did pressure testing with the breathing tube, and she was taken off of it around noon. They moved her off of the morphine and the other sedative, and now she’s just on an epidural, which is managing the pain pretty well. She’s alertish, and knows we are here. Her breathing is a bit shallow, and she’s been running a low-grade fever, but generally she has been in pretty good spirits. They are doing breathing treatments to help her lungs expand more and they seem to be slowly helping. Her fever seems to be headed back down, too. She’s being moved around/shifted periodically to prevent bedsores and such, and her care team has been absolutely stellar. It’s sometimes hard to parse all of the information because it’s such a steady stream of really kind, compassionate, well-trained and uber-competent people telling you things you need to know, but everyone does their best to make sure we understand, and our needs are met, despite the sleep deprivation and stress. These are the kinds of people that you WANT around your kid when they’ve had surgery, and we are blessed to be surrounded by them. She is slowly draining all that fluid out, and seems to be headed in the right direction. I cannot thank EVERYONE enough for all of the love and support we’ve been getting, both in person and online. Truly. It means the world to us, and we’ve been sharing your kind wishes with Caitlin, too. I don’t know if I’ll get around to thanking everyone individually, but please accept our gratitude. We are lucky to have you. So glad to read the update. I’ve been thinking about you and Michael and Caitlin a lot.